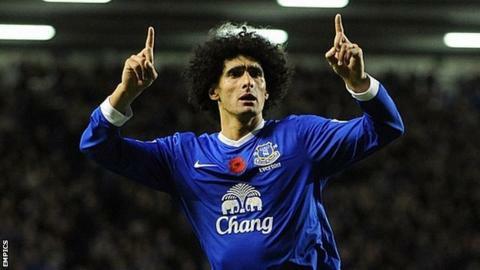 Everton fought back to seal a victory over Sunderland that keeps them in the top four of the Premier League. Adam Johnson swept home his first goal for Sunderland to give the Black Cats the lead on the stroke of half-time. But Everton's dominance paid off with two goals in three second-half minutes. Marouane Fellaini drilled a shot into the bottom corner, before his sublime flick set up Nikica Jelavic to steer home the winner in boss David Moyes' 400th Premier League game. It was the sixth time in a row Everton have managed to avoid defeat after conceding the first goal, and extended Moyes's unbeaten run over Sunderland to 18 games. Despite losing the creativity of Kevin Mirallas to a hamstring injury in the first half, the Toffees bombarded the Sunderland goal throughout the second half and were rewarded with a victory that ended a run of four straight draws. Sunderland boss Martin O'Neill, whose team are now only three points above the relegation zone, saw his goal-shy side fail to convert three clear-cut chances in the first half, two of which arrived inside the first 10 minutes. Everton keeper Tim Howard - watched from the stands by United States manager Jurgen Klinsmann - showed off the talents that have made him his country's number one by pulling off a sharp low save to deny Stephane Sessegnon after the Benin international had been played in by Steven Fletcher. Adam Johnson was only the second player to score a Premier League goal for Sunderland this season, with Steven Fletcher being the other. Excluding own goals, Johnson's was the first league strike by a Sunderland player since 29 September, ending a run of 444 minutes without a goal from a Black Cats player. Marouane Fellaini has scored as many goals this season in the league as in his last three campaigns combined (six). Sessegnon then returned the favour to set up Fletcher, who dragged his low shot across the face of Howard's goal. Everton responded with a period of sustained pressure, with their brilliant Belgians Mirallas and Fellaini pulling the strings in midfield. Their best chance came the way of Steven Pienaar, whose shot from the right drew a routine save from Simon Mignolet at his near post. Sadly for the Blues, Mirallas appeared to tweak a hamstring in threading the ball through to Pienaar, and could play no further part. Despite Everton's pressure and territorial dominance, Sunderland continued to create the better chances. Jack Colback wasted a chance from the inside-right channel with a weak shot at Howard. And, on the stroke of half-time, Jelavic's headed clearance from a corner fell to Gardner, who clipped the ball back over the Everton defence for Johnson to fire past Howard. Predictably, Everton began the second half on the front foot and came close to taking the lead when John Heitinga's header from a corner was cleared off the line by Johnson. The one-way traffic continued but time after time, full-backs Leighton Baines and Seamus Coleman found space on the flanks, only to fail to pick out a blue shirt with their cross. Sunderland's resistance was finally broken with 15 minutes remaining when substitute Steven Naismith's pass found Fellaini, who turned sharply and shot low from the edge of the box past an unsighted Mignolet. Three minutes later, Leon Osman fed Fellaini on the edge of the box, and the Belgian's clever flick through John O'Shea's legs set up Jelavic to curl in. With 10 minutes left, Sunderland fashioned a chance to level, but Carlos Cuellar's close-range shot struck Gardner on the back and deflected to safety. Everton manager David Moyes: "We kept knocking on the door, never gave up, trying to score and forcing the issue. Sunderland made it really difficult for us because they have a great defensive record and are good on counter-attack. "Everton have done it again. A goal start for the opposition but still David Moyes' team come back to win the game. They have impressed with their relentless attacking football but they keep on doing it the hard way." "I thought we were unlucky to come in 1-0 down because our play was good but we gave them a few chances. We will have to look at that and try to do a bit better. "The best teams can attack and are strong in defence. Getting that balance is how you become top team, scoring plenty of goals and not conceding too many. I don't want us to be giving the opposition too many chances." Sunderland manager Martin O'Neill: "We could have been three up by half-time. We had three great chances and finally got a goal which we deserved. "We were under pressure in the second half and they hit us with two goals in about a minute and a half. "There is great sprit among the players and that was epitomised today. We are playing a team that is going for a Champions League spot and we played brilliantly today and were very unlucky. "Danny Rose's booking in the last couple of moments of the game beggars belief. It was unbelievable and that was the story of the game. When the referee sees it again he will be embarrassed.